Oahu + Honolulu Helicopter Tours of Hawaii - Sightseeing Flight with Makani Kai - Dedication to Excellence! Enjoy a breathtaking Helicopter Adventure Tour over Honolulu and the most spectacular areas of Oahu! Free pick up from your Waikiki Hotel on all flights. 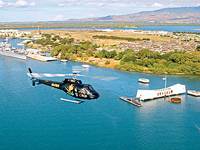 Makani Kai Helicopters is Oahu's oldest, largest, and most experienced helicopter tour company. Established in 1988, Makani Kai, which means "wind over the water," employs modern jet turbine helicopters and an unsurpassed dedication to safety to ensure that your aerial tour is a premier experience. Makani Kai Helicopters is an FAA operation based at the Honolulu International Airport. Free pick up and delivery to and from Waikiki hotels is provided! This tour begins with a beautiful view of Keehi Lagoon and historic Honolulu Harbor. Here you will see Aloha Tower, as well cruise ships from distant ports. Next is downtown Honolulu. Above the city stands Punchbowl, the National Memorial Cemetery of the Pacific. The tour continues above Ala Moana Beach Park, Magic Island, the Ala Wai Yacht Harbor and Waikiki Beach. Beyond, you'll see Diamond Head crater the "Gold Coast", and Hanauma Bay. Rounding the east end of the island, you'll see rugged coastline, inviting Sandy Beach and Makapuu Point and lighthouse. Your aerial tour continues over Sea Life Park, the estate where TV's Magnum P.I. was filmed and miles of white sand beach. You'll be treated to a stunning view of Mount Olomana and, later, the Nuuanu Pali where King Kamehameha's warriors won a decisive battle to unite the islands. This spectacular tour shows you the very best of the island. Depending on weather conditions, the pilot will select the most suitable route to show passengers all the must see attractions and scenic vistas, from serene Keehi Lagoon and historic Honolulu Harbor, to Aloha Tower, Ala Moana Beach Park, Magic Island and world famous Waikiki Beach. On the eastern end of the island is Hanauma Bay, the remnants of a volcanic crater that is now a marine sanctuary and popular snorkel spot. Up next come the Halona Blowhole, Sandy Beach, Makapuu Point and lighthouse, and colorful Sea Life Park. After cruising above the powdery white sands of Waimanalo Beach, the tour continues over the gorgeous coral formations of Kaneohe Bay, distinctive Chinamans Hat, and then up into Jurassic Park valley, where a dozen major motion pictures have been filmed. The highlight of the tour is Sacred Falls, a shear and splendid 1,000-foot cascade. On your way over Oahus Central Plain, you'll see the world's largest agricultural maze at the Dole Pineapple Plantation and the birthing stones of Hawaiian royalty. Your tour concludes with a panoramic vista of Pearl Harbor. This grand adventure includes everything in our other tours but continues on past Sacred Falls, over the Polynesian Cultural Center, one of Hawaii's most popular visitor attractions, and the Mormon Temple in Laie. You'll also see Turtle Bay, the aquaculture farms and Kahuku Point, where whales frolic in the winter. The tour continues along the storied North Shore, with a dramatic view of world-renowned surfing spots including Sunset Beach, Pipeline and Waimea Bay. On your way over Oahu's Central Plain, you'll see the Dole Pineapple maze and the "birthing stones" of Hawaiian royalty. Your tour concludes with a panoramic vista of Pearl Harbor. Pickup times: Complimentary hotel pickup from major Waikiki hotels approximately 30 minutes prior to check-in time. Times and availability are subject to change. Select your preferred time-frame and we will book you on the closest departure available. To specify more exact times or make special requests, use the Comment Box when checking out. All times and availability subject to change. Note: Passengers weighing between 240 and 299 pounds pay an additional fee of $100, passengers weighing over 300 pounds will be charged for an additional seat. Children 24 months and younger fly free! Children over 24 months are booked as adults. Due to heightened security measures it is essential to have a photo I.D. Carry-on items are limited to essentials (i.e. medical needs). International guests will be required to present their passport and photo I.D. Tours available mornings & afternoons. Please Complete Activity Information Book children over 2 as adults. Children 24 months and under fly FREE!